At Anthony Spink Dental Suite, we provide high-quality solutions for your entire family. No matter what your age or concern may be, you can feel confident that our experienced team will assist you. If you have had damage to your smile, a crown or bridge may be the best way to rebuild your teeth so that you can have their full function. Dental crowns and dental bridges can rebuild your smile by repairing teeth, replacing missing teeth or correcting your bite for a perfectly aligned look. Our modern approach to dental care keeps your procedures efficient and effective, particularly with the advanced technology of same-day restoration (E4D) system. 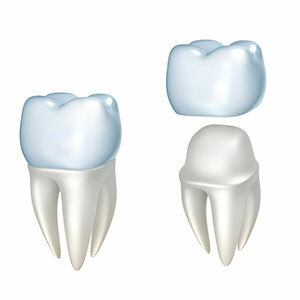 There are several different situations in which a dental crown is appropriate. If you have a tooth that is fractured, broken or damaged from grinding and age, want to replace a large filling or have had a root canal, a crown may be the ideal solution. Crowns are made from durable, natural-looking porcelain, custom-created to your specifications. The colour is seamlessly matched to your smile for a picture-perfect look. It’s bonded to the damaged tooth to protect it and allow it greater stability. We want your visits to run smoothly and fit in with your busy schedule. We’re proud to offer same-day crowns that don’t require messy or uncomfortable moulds. Instead, digital impressions are taken in just minutes, allowing for a precise impression of your teeth from every angle. The scans taken are sent to the design centre that sits chairside so that your restoration can be custom-created for you. The design, once finalised, is sent to our on-site milling unit to create your veneers, crown or bridge on the day. You won’t have to worry about having multiple appointments spread over weeks, and you can count on a precision-made restoration from us. Losing teeth affects your self-esteem, overall health and appearance. A bridge spans the gap left by the missing teeth, held in place by the neighbouring teeth on either side. Your other teeth will be prevented from shifting out of position, avoiding further tooth loss, periodontal deterioration and a decline of your facial structure. You’ll enjoy normal speech, a proper bite and feel confident when you smile. The process of receiving a dental bridge is completed over two to three appointments. Once we determine that a bridge is suitable for you, we’ll take impressions that are used in our on-site ED4 unit. Your bridge will be fabricated just for you, then fitted into place for a seamless look. Are you ready to get started? Contact Anthony Spink Dental Suite today to book your visit for crowns and bridges Brighton! Same-day and late opening hours are available to keep your time with us convenient for you. Do you have dental cover? Your rebate can be claimed on the spot with HICAPS. We are a preferred provider for Medibank, HCF and MDF.